This is our version of the classic French Charlotte cake. Everyone seems to take their own spin on it. I love how the sweet/tart mouse and raspberry preserves complements the soft cake and lady fingers. 2/3 cup cake flour make your own with 2 ingredients! In medium sauce pan, combine: 10 oz frozen raspberries and 1/2 cup sugar. Cook stirring occasionally until jam consistency. Remove from heat and strain through a sieve, pressing on the fruit with a spoon to extract as much raspberry juice as possible (you should get 2/3 cup syrup). Into the raspberry syrup, stir in 2 Tbsp lemon juice and 1 Tbsp gelatin. Pour syrup back into sauce pan and place back over medium heat, whisk until gelatin is dissolved. Do not boil. Remove from heat and cool to room temp. Line a 9" springform pan with parchment paper. Preheat oven to 350˚F. In the bowl of your mixer with the whisk attachment on high speed, beat 4 eggs for 1 minute. Gradually add 2/3 cup sugar and continue beating on high 7 min until thick and 3 to 4 times in volume. Stir together cake flour and baking powder then sift flour into whipped eggs in 2 additions, folding to incorporate between each addition. Scrape from the bottom to catch any hidden pockets of flour and fold just until incorporated - don't overmix. Bake at 350˚F for 23-25 minutes or until top is golden and springs back when poked lightly. Once it's out of the oven, remove cake from pan by sliding a thin edged spatula around the edges. Transfer to wire rack, peel back parchment and cool to room temp. Then slice cake layers in half horizontally. Cover springform walls with plastic wrap. Trim off 1/2" all around the edges of both cake layers (I used kitchen scissors) and place the first layer into the bottom of your springform pan. Trim about 1/2" off one end of all lady fingers. Place lady fingers in a tight ring, cut-side-down, around the cake base then brush cake with 1/3 of the simple syrup. Brush backs of lady fingers with 1/3 of syrup as well. Spread 1 1/2 Tbsp raspberry preserves over cake. Set aside. With the whisk attachment, beat 3 cups heavy cream with 6 Tbsp powdered sugar on high speed until thick and spreadable. Remove 1 1/2 cups of whipped cream to a piping bag fitted with a star attachment and refrigerate to use as topping later. 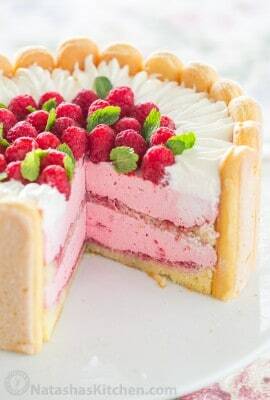 Once raspberry syrup is completely at room temp (don't wait way too long or it will thicken and become difficult to blend), fold it into remaining big batch of whipped cream adding 1/4 syrup at a time and folding between each addition. This is your mousse. Spread 1/2 of the mousse over cake layer inside the springform. Top with second cake layer, brush with remaining simple syrup and spread with 1 1/2 Tbsp raspberry preserves. Add remaining mousse. Pipe whipped cream and top with fresh raspberries and mint leaves if using. Cover with plastic wrap and refrigerate until set (3 hours or overnight). To serve, remove springform walls and plastic wrap.